Home » vent » Dirty Air Filters and Allergies - Don't Forget the Car!!! Dirty Air Filters and Allergies - Don't Forget the Car!!! Most people with bad allergies know to change their home's air filter at least quarterly with at least a 1000 microparticle performance rating (mpr). Such filters will remove pollen, dust, and other airborne particles that may exacerbate allergies as well as keep the vent system within a home clean. BUT... allergic patients should also not forget to change their car's air filter as well regularly, especially given the car is moving around outside and people often have the air conditioning or heat turned on blowing into the face. 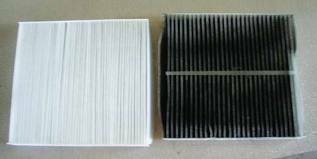 And guess what... there are many different quality car air filters. As such, do recommend that whenever you have your car for maintenance, request the mechanic to show you your car's air filter.